This is the book I was going to write someday. I howled when I saw a copy of Live Like A Narnian at a conference we attended last fall. "No! No! No!" I muttered to myself as I reached over and pick it up. I had to buy it, of course. I had to buy it knowing that my title was gone and likely everything I wanted to say with it. If this sounds dramatic, it is because it was. (I'm snickering at myself, in case you couldn't figure that out.) It was my best idea for a book and the one I was most passionate about. 5. He has some bits of wisdom to pass along. 3. There is very little original thought contained within the covers. At least, not enough to blow my mind or even breeze my socks partly off my feet. Coincidentally, I think Rigney agrees with me because he also quoted Wilson more than once. Also Peter Leithart. I know we're reading the same people. I know we're gleaning the same thoughts. I know we have the same passions. I think he leapt too quickly in publishing this book. And keep in mind the fact that I would have been great with it being published without my name anywhere on it if the book was as mind blowing as I think it could be. But, really, if you have to pick a title to read that is about Narnia which highlights Christian principles from the story then go with Wilson's work. It's insightful, practical, deep, inspiring and unique. I feel very snobby and condescending when it comes to this book. I truly do not mean to be (even though it sounds like it). Of course I grumbled when I saw it, but I hoped to settle in and read something that would stretch my thoughts further. Alas, I didn't find it. Although I'm tempted to envy him this book, with this title and with his name on it, I'll try not to. (I'm so magnanimous, I know!) It really could have been great, but I just don't think it's full of many independent and unique thoughts. What he says here can all be found elsewhere and that makes me feel like it's not the best to recommend. I honestly think What I Learned in Narnia is better. Truly, until someone comes up with something better than What I Learned in Narnia , I think they ought not to publish at all. I know nothing about Joe Rigney. I like the title of his book. I genuinely appreciate his passion for these stories by Lewis. I love that he wants to spread the love with other people. I just think he should have waited to publish for awhile longer, until his very own thoughts were more developed. He might have still beat me to the quick and that would be very much ok. I'll live like a Narnian beside him, breathing Narnian air, and will continue to be inspired but these fantastic, mysterious "children's books" created by Lewis. Through a thousand re-reads of those Narnia books, I will always walk away having learned something new. It's nice to know that the same is true for others. So many duplicate titles are published every year, by the time you are ready to write the book (and I will so read it), this one will be forgotten. Thanks for the review. Sounds like, despite the title, I can skip it. I had thought about this one - looks like if he quotes Wilson a lot I should probably just go for that one. I've been reluctant to read any book like that because I want what I learn from Narnia to be my own rather than anyone else's, if that makes sense - yet I know I could probably gain some insights into things I missed by looking at them - or at Wilson's book, anyway. Sympathizing with your title loss - I think I mentioned I had the same thing happen with Jen Wilkin's book. I truly was thinking about writing a book with the very same title. While I realize it's probably a bit rude for an author to walk into a reviewer's website unannounced, I couldn't help myself. 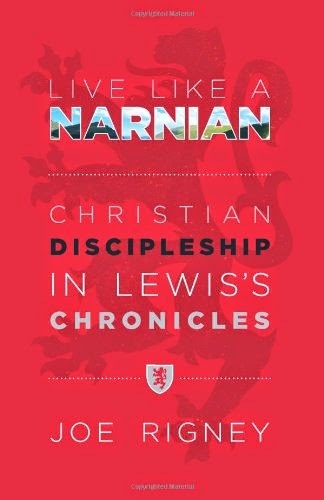 There haven't been many reviews of Live Like a Narnian, and critical ones are the most fun. First, let me say that I'm not offended in the least by your review, nor do I begrudge your passionate opinions. Narnia occupies a special place in many of our hearts, and couple that with the loss of your book title, and I completely understood your (faux)-frustration. Second, let me agree with two of your points. First, when it comes to wisdom and insight and writing capacity, Doug Wilson's just flat out got me beat. Coming in behind him neither surprises nor bothers me, and I'm delighted that my book even warranted a comparison with his. Second, I agree that I may not have been ready to write this book, if by that you mean that I wasn't able to do Narnia justice. However, in my calculation, I don't think I'd ever be truly ready to do Lewis justice, so I had to content myself with a small contribution on the 50th anniversary of his death. I did have a couple of questions about your review, if you don't mind me asking. First, though I certainly recommended Wilson's book in LLAN (a couple of times actually), I don't recall quoting him a lot (or at all, directly). I do quote Leithart twice (though not on Narnia). Am I missing something? The other question I had was about the notion that my book is full of quotes from other authors. By my count, I only quote other authors 5 or 6 times (Barfield, Leithart, Chesterton, Kilby, and S.M. Hutchens). Most of the quotations from outside of Narnia come from Lewis himself in his other works (which was, of course, part of my aim). In any event, I do appreciate the review, and while I sincerely apologize for stealing the title from Puddleglum before you were able to (and for not attaching the title to a mind-blowing or sock-breezing book), I do hope my use of it doesn't dissuade you from making your own contribution to our appreciation of Narnia. If you love Narnia half as much as your post suggests, I'd be very eager to read it. :D A nod and a Narnian bow to the good King Lune. @Rigney, your comment is most gracious. It IS truly a compliment (from my perspective) that I would pick up your book hoping for a companion to Wilson's book (which I think is so great and awesome, etc.) And I AM keeping Live Like a Narnian on my shelf with parts of it underlined because my kids will have to read your book someday. I at least beat you to the blog title. :D HA! I hope you stay unoffended and chuckling.